Our definition of team is “a group of people who demonstrate cooperative and supportive behavior in a common effort to accomplish hard goals; and who are equals and friends who value a relationship built over time and expressed in mutual understanding, honesty, sympathy, empathy, and loyalty.” We summarize this to say a team is comprised of equals (called “peers”) who are “experienced” and are “friends.” Often, our adventure partners start as strangers. To build a team from strangers, we need to understand how to build appropriate relationships and learn how to behave during the developmental process. Done well, we can find people with whom to develop friendships so we can trust each other with our lives, and work together synergistically. Friendship is an affinity and acceptance between two or more people, and is the product of finding common ground and spending time together to learn about each other and establish trust & respect. At the other extreme, strangers are people we don’t know and cannot trust. It is far better to be among friends atop the high peaks. If the members of the group are not yet “friends” or will never be friends, then we know we must continue to work on the relationships or the partner roster before we can ever have a “team.” We all know how to make friends. It is one of the first things we learn in kindergarten. Oddly, it is also a very difficult process to describe clearly. 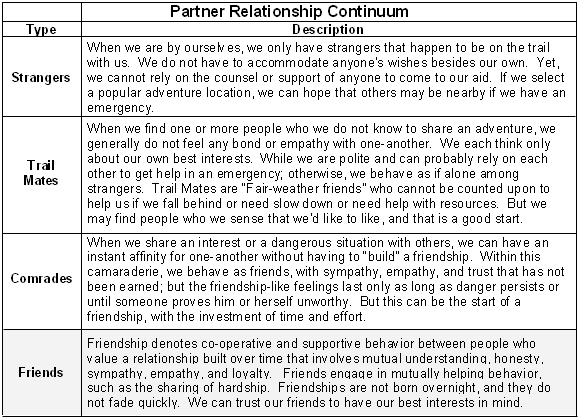 But there are a few aspects of “making friends” that we can describe, which should be helpful or at least interesting. These features just scratch the surface of the process of making (or losing) friends. But it is a human instinct; we need only put our hearts and minds to the task to succeed. We all know how to make friends. It works the same way in the mountains. But there are additional behaviors that have not been taught in kindergarten; these behaviors will: help our group work learn to work together, help our efforts to create the bonds of friendship, and help us to find safe success in the high peaks. The heroes of American culture are at the pinnacle of autonomy, self-expression and assertiveness. But we don’t need heroes; we need good teammates. 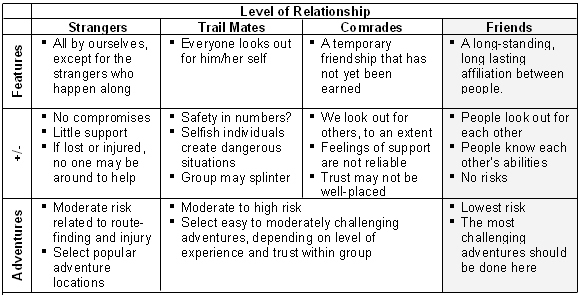 Atop the high peaks, each partner must have the view that working for the good of the group is a duty and the route to personal success. 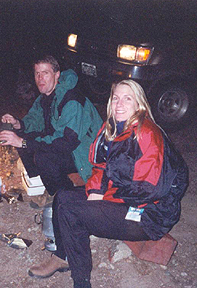 If we cannot be honest with our partners, cannot put the group’s safety and success ahead of our own personal goals, and cannot see the wisdom is being a likeable person; then we will never be able to be a part of a mountain adventure team. There is room in this world for lone wolves, but just not on our adventure team. The personal behavior of each group/team member is critical to the safe success of all. 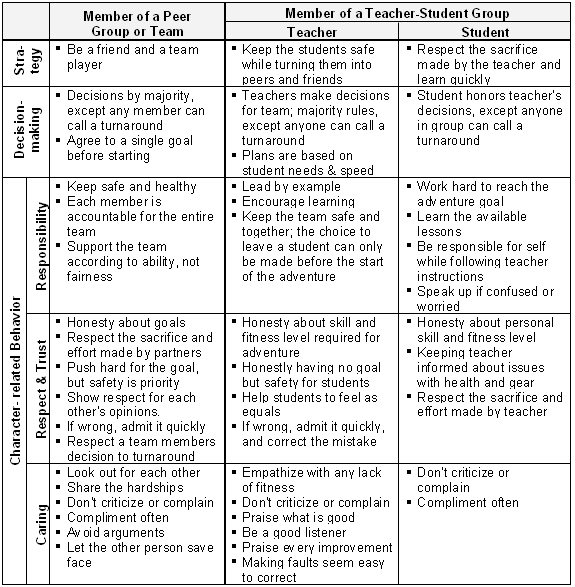 For those of us interested in being a member of a safe and successful team, below is a summary of the behaviors and attitudes that will help us to succeed. A high peaks adventure “team” comprised of friends is a “fellowship of the high peaks.” It is a small group of people united in a relationship and sharing a love for playing atop the high peaks. 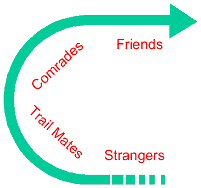 The members of the group are friends and equals; the group has no hierarchy or structure. And, aside from family, it can represent the strongest relationships of our lives. A good team is like a fine wine…it takes time to develop and must be treated carefully in the meantime. And, it only works when we start with the right ingredients. But it is worth the effort. We are all richer in life when we are a part of a Fellowship of the High Peaks. Good adventure partners working as a “team” makes all the difference.